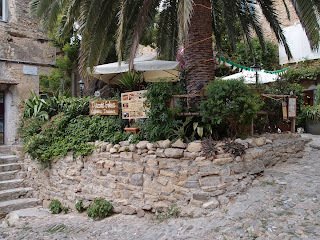 There are several restaurants in Bussana Vecchia. 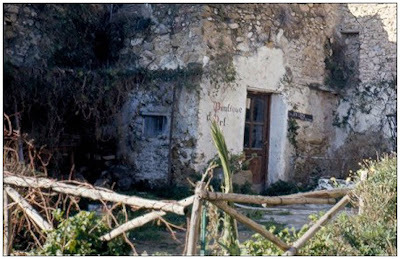 This one, the Piazzetta Golosa welcomes you as you enter the village. This gentleman is fixing the Italian flag to a pole prior to flying it. It was the 15th July when I took these photos but I can't find that it was a specific public holiday in Italy. Il y a plusieurs restaurants à Bussana Vecchia . Celui-ci, la Piazzetta Golosa, vous accueille à l'entrée village. 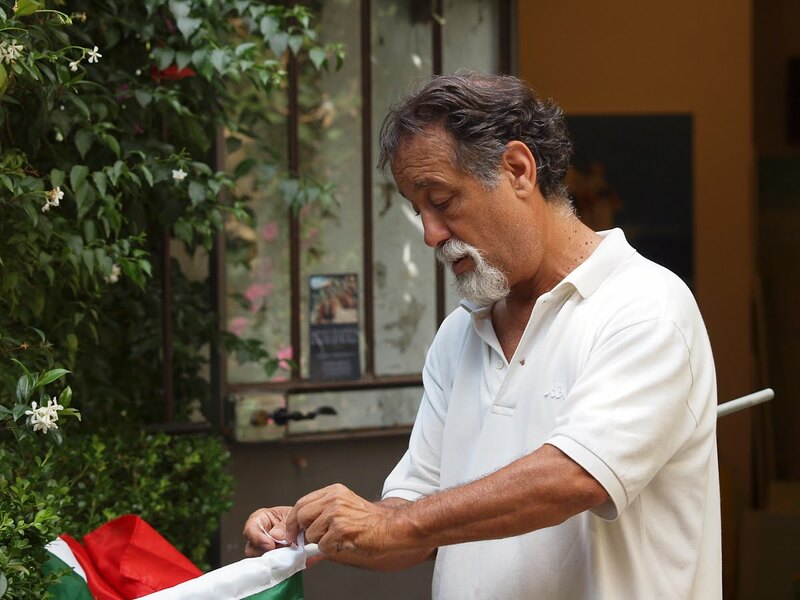 Ce monsieur est en train de fixer le drapeau italien à un poteau avant de le hisser. J'ai pris ces photos le 15 Juillet et je ne crois pas que c'était un jour de fête spécial en Italie. This is a delightful series on a charming place. The most quaint towns today are the ones who history passed by and were left alone, sometimes in decay, until they were rediscovered. Perhaps he just likes to display his flag, as we often do in our home on sunny days. I am intrigued by this place. Has the government decided to "let it be" or are there unresolved issues regarding the artist-generated community renovating the ruins? Your photos are (as usual) just beautiful. Merci d'avoir repris le palmier. C'est très émouvant. Et cette "saga" toujours aussi passionnante. The way of life certainly seems to be slower and simpler. As though everyone there goes by 'retirement' time. I imagine the flag goes up every day? I think I saw a sign up that they were having a flag or banner festival in the village - might have been to do with that? Or just opening up for the day?